My blog is undergoing a revamp. And it has not been easy, the effort of getting thinks the way I want them is giving me a headache. Now Blogpatrol isn't working and my stats are all gone. Flickr's been giving me a hard time too, all of my pictures disappeared and I got tired of waiting for help so I went a reloaded them along with some new ones. I am working on indexing my site, hence the table at the bottom of the page. I am trying to put all of my links and projects into a useful format. I am not sure this is the best way but I am going to give it my best. I am hoping that when I am done, I can use the table to access all of my projects as well as all of the links I keep recording. If it doesn't work I am going to have to take the plunge and get myself a true and proper website I guess. On the cool side I won my first eBay auction! Not too exciting for those who are old hands at this. I have won an auction or two in the past however they were on behalf of my husband and involved motorcycle stuff. This auction was for 6 Handcraft Illustrated magazines, which are no longer in print. I am so happy! Now I get to try out Paypal and start looking at selling things myself (not quite yet). Tonight is a fundraiser spaghetti supper for Girl Guides and Boy Scouts and I have volunteered to stock the craft table. Not with stuff for sale but with something for kids to do. So, Pasta dinner - we'll be making Pasta Animals! Cool eh? I am going to try to get a few pictures of them tonight. I made a giraff, a dog and a truck, after all I am bringing in Lina's street carpet for the kids to play on. This week has been mad. Monday was a District Meeting for Guiders, Tuesday was Lina's second gymnastics lesson, tonight is the spaghetti dinner and Saturday I am presenting at Brownie Badge Day - 2 sessions. So I will be quite happy to sit down with a glass of wine Saturday night when it is all over. I've also been working on a little amigurumi pattern (will be reveiled later) but I am having a hard time trying to figure out what to do with the face. Hint - Easter themed. I am happy to hear that Backtack is coming up with a new round soon, April 5th is the sign up date. I don't think I will be entering this one. I have promised to cleanup my UFOs before starting anything new. But I am excited to see what the girls at backtack come up with! I had to share. For those of you who may have been reading my blog for a while, you might know that our daughter has had some learning difficulties in the past few years. Imigine my swelling pride when I picked her up on Friday and found that she had won a first place medal for her Science Fair entry "Sand Erosion in a Box". 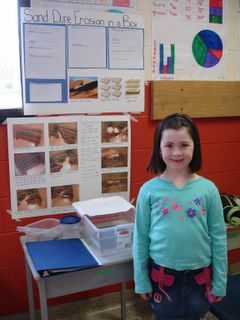 First place out of all the grade twos that entered a project in the fair. I am so happy that she has had the opportunity to see that hard work has concret rewards. Yeah to Lina! To celebrate, hubby and I took her to the movies Friday night. She wore her medal the entire time. A little while ago, I participated in an ATC trade with the theme "Virus". 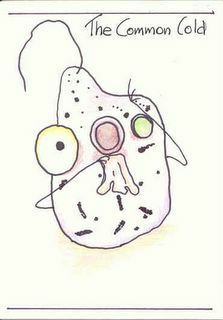 I certainly had alot of fun anthropomorphizing (gotta love those big words) those silly little viruses. And wouldn't you know it, at the time I had a "Monster" of a cold. 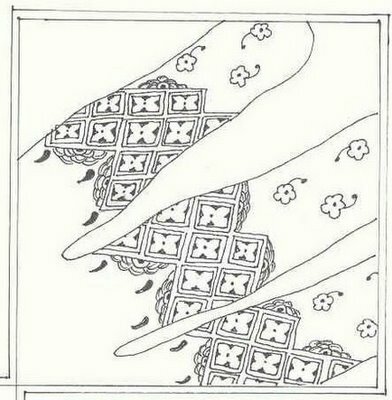 I wanted to scan these cute embroideries her as well. 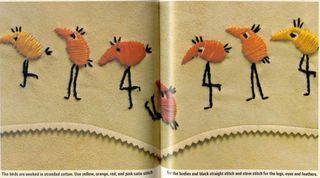 They are from the Make it Yourself book I posted earlier today. They would so whimsical on... well something. And not to forget these birds. They are the reason I bought the book! 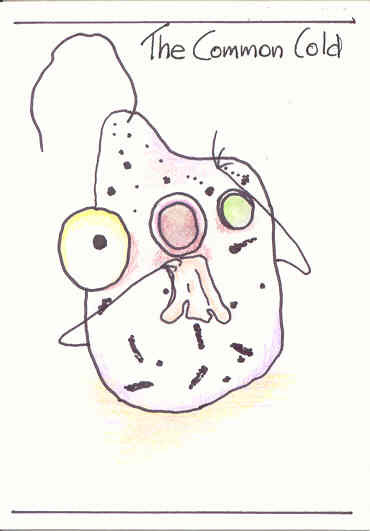 The book only cost me 50 cents, a bargain, I get to laugh at these creatures whenever I want. Last week, Friday when I took the day off to be with Lina on her March Break, we went to Value Village (second hand bliss!). 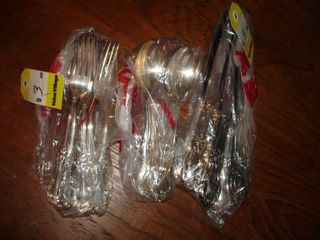 The trip cost me about $12 for 6 knives, 6 forks and 6 spoons. All sterling silver. When I was in Cuba, I bought myself a ring made from the handle of a spoon, something like this I love it, it's so compfy and so out of character for me. 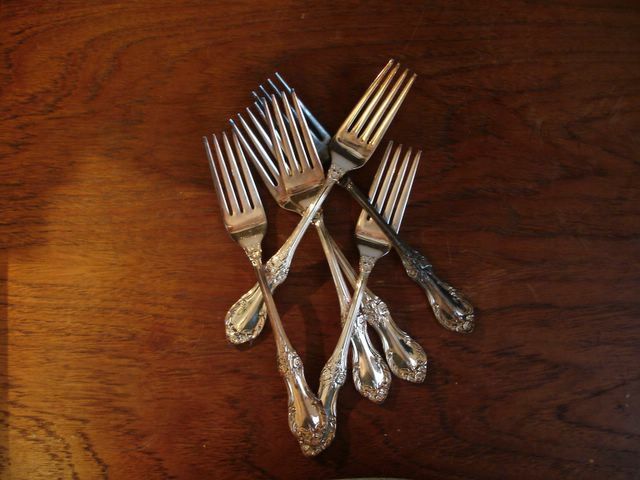 I bought my mom a bracelet made from a silver fork, something like this one, her's is a little fancier due to the original silver motifs on the handle. Anyway, I love silver and I love old stuff, so I thought I would toy with the idea of making some for myself. Now all I have to do is figure out how to bend it the way I want it to go. And I need a jeweller's saw to cut the pieces. When I showed my hubby what I had bought, he (and more than a little bit of me) figured it was a shame to destroy the cutlerly, especially since they are a matched set of 6. 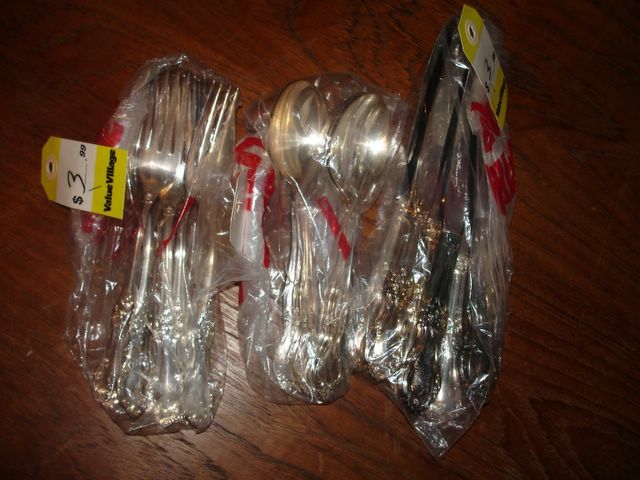 Well I can't see me using silverware, so I think jewellery it is! One of my favourite things to do instead of going to the gym at lucnh to work out, is going to Allison the Bookman's Used Book Store and browsing the craft magazines and books. I'm usually good for about $15 work of new treasures every trip. Probably the reason I didn't go today, I'm broke. But the last time I went I netted a few books that I am still pouring over. They don't find a place on my bookshelf until they resided on my night table for a few weeks. 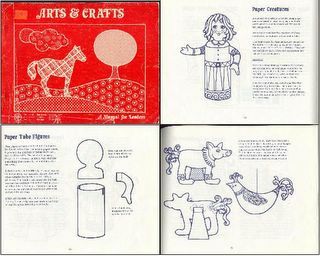 Arts & Crafts, A Manual for Leaders was a booklet prepared by Maggie Miles for the Ministry of Culture and Recreation Canada. A Google search produces absolutely nothing regarding either it's purpose or its origins. However, as the cover indicates the Minister of Culture and Recreation was the Honourable Robert Welch, a Google search indicates that he was Minister from 1975 to 1978 so that places the printing of this book during that time. I love the illustrations and the projects are simple and yet very stylishly done. 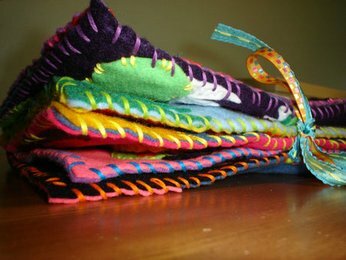 There are projects on puppet making, paper mache, design, applique, stichery and weaving. These are pages 71 - 73 and explain how to make paper figures. The happy partridge is my favourite. Lina started Gymnastics on Tuesday. While shopping at Rebuilt Resources, more than just a second hand store - for some leotards for her (did I say I was broke this week? 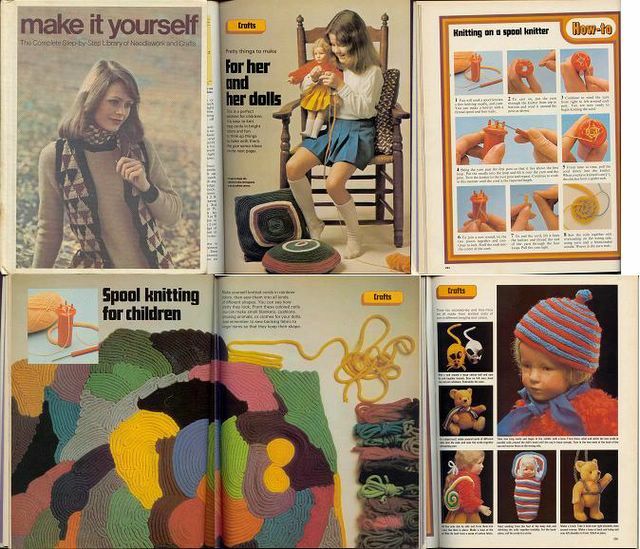 ), I found some vintage craft books. This one is Volume 3. 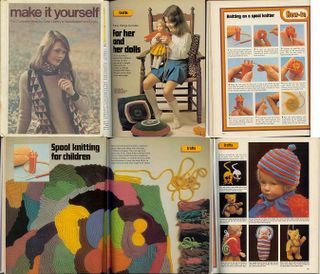 Printed in 1975, it had a few quirky knit fashions and then I found this project for kids. 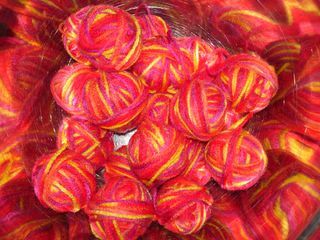 Spool knitting. OK, so I know that we still do this today, but what the? Did kids back then have more patience? Check out the blanket made of spool knitting. I can't get Lina to sit still for more than an hour of spool knitting, how long did it take to make that blanket? I do like the hat for the doll and the little mice though. I've begun a “new chapter” in my life, so to say (ha ha). Today being my Inspiration Wednesday, I was in my craft room this morning looking for something that inspires me to post about or surf for today and I noticed that I have started to amass quite a few vintage children's craft and activity books. So, I thought, well wouldn't that be a wonderful resource to share with people? I get quite a few ideas for crafts from these books, both for me, my daughter and for Brownies, that it seems rather selfish of me to keep them all to myself. 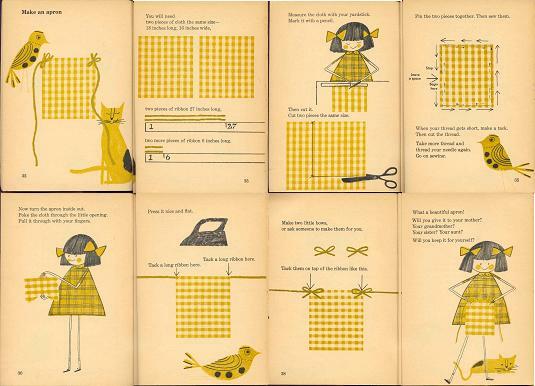 So many of these crafts and activities get recycled after a few decades into new books and magazines I think it is fascinating to see them in an earlier incarnation. 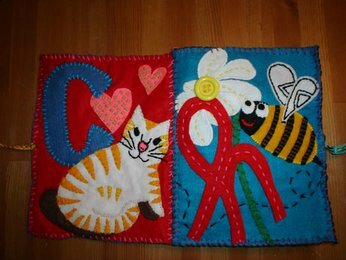 So, I started a new Group on Flickr called Vintage Children's Craft Books which will store what will hopefully become a wealth of vintage craft ideas and activities for kids. Please stop by and join. Please stop by and post your own books, magazines, pamphlets, craft sheets... And don't forget to post pictures of your creations, inspired by these wonderful resources. Even better! Post pictures of what your children create! So, for my first book. 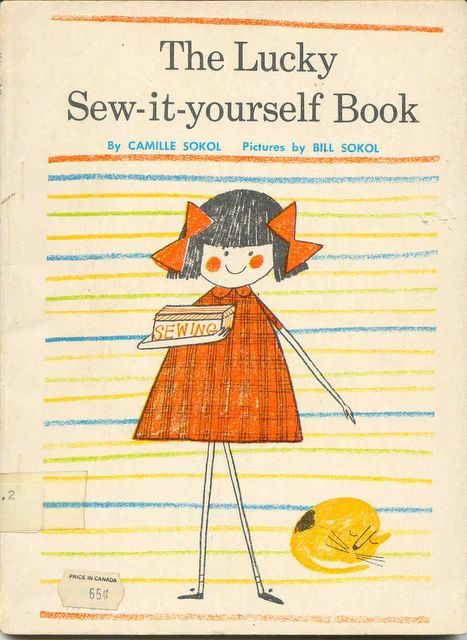 The Lucky Sew-it-yourself Book, written by Camille Sokol and illustrated by her husband Bill Sokol. This is a very cute booklet copyright 1964, my copy was reprinted in November 1972. It is called "The Lucky Sew-it-yourself Book" written by Camille Sokol, pictures by Bill Sokol, published by Scholastic Book Services. I got my copy for free from my daughter's school which from time to time places great stacks of books in the hallway for anyone to help themselves. We've been helping ourselves a lot this year! A search on Google netted the delicious fact that both Wee Wonderfuls and Turkeyfeathers have a copy of this book as well. Lovely people to have something in common with. I also found an ISBN or reference number: B0007I8NL8 PAPERBACK-CG. The full pages of this project "Make an Apron" (which I post in honour of Amy at Angry Chicken, whose Tie-One-On inspires me so much) are available at the Flickr Vintage Children's Craft Books group or in my Flickr album. The search also revealed that the Sokols authored/illustrated another book that I would like to see called “How to be Mother's Helper”. 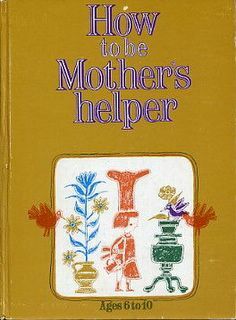 According to Alibris.com, it is contains “Simple instructions on knitting, cooking, gardening, making collages and other things for the home from available household articles.” published by Platt & Munk in 1968. (There are a few pictures from the interior shown here , just scroll down and click on the picture of the book and a pop-up will reveal a few charming pages. 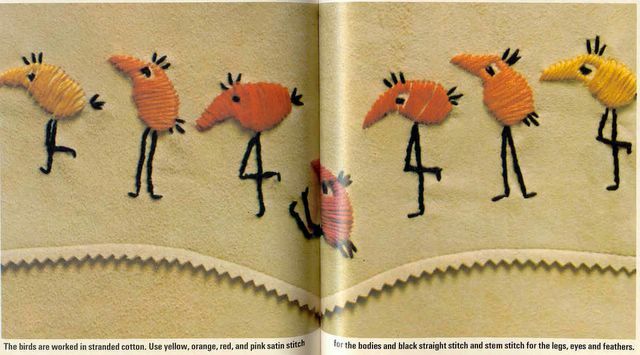 A search of Bill Sokol also revealed that he illustrated quite a few children’s books with his delightful style. I have more books to come. So stay tuned. I'm off tomorrow and Friday with Lina, maybe this could be something we work on together? Please let me know if anyone's kids make the apron, and I will link to them here. I am feeling so blah today. Yesterday I spent the whole day cleaning and puttering around the house, buses were cancelled for our entire area due to freezing rain so I had Lina home from school, I haven't been feeling well and called in a sick day because I am fighting something in my throat, ears and sinuses and felt I needed to attend to that anyway. 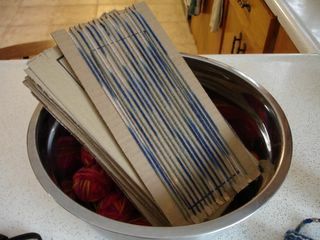 One of the things I had to accomplish yesterday was to get some weaving together for Brownies. I had offered to put something together for the girls to work on over the March break. We've never really asked them to challenge themselves with new techniques.... anyway that doesn't really enter into why I am feeling so crappy today. I actually enjoyed putting the little kits together and tried many different ways to ensure the girls would have success with them. 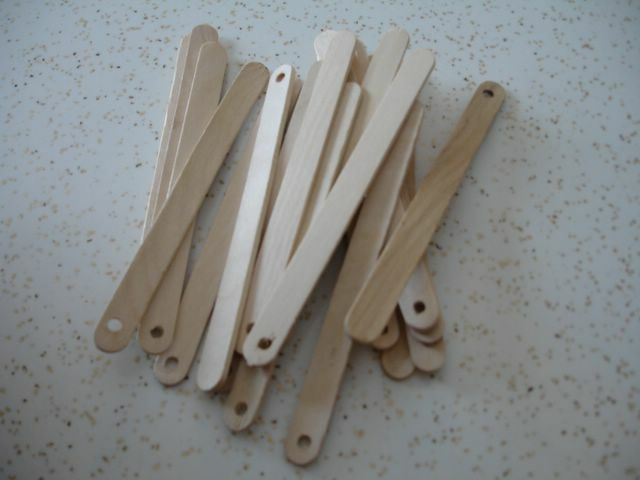 Then I tried to figure out the easiest type of shuttle and came up with drilling holes in popsicle sticks. I figured it would be the easiest way to weave in and out of the threads. Then the looms, after making a prototype I made 19 cardboard looms with 17 slits on either side. I thought it might be easier for the girls if I drew a template on the looms so that they could use it to make their tension as even as possible and at the same time would know when to stop or at least how long to make their weaving. 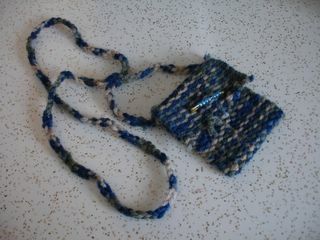 And here is the little woven purse prototype. This morning, I felt just a little bit proud when Lina came out from her bedroom still rubbing sleep from her eyes and proceeded to pick out her ziplock bag from my Brownie stuff and start weaving on her loom. Joy, joy, joy. Tonight, hubby and I were sitting at the table after dinner, not quite wanting to move and Lina proceeded ahead of us downstairs to watch TV bringing her loom with her. She's about 1/3 of the way through. Tension is a bit off, but she's doing it by herself. I am so proud. This is a detail of a larger composition of different henna tattoo designs I sketched. Ink. When my daughter was four, she was lucky enough to be invited to her daycare worker Saima's, Mehndi ceremony. Not being from the same culture, it was such a wonderful experience for both of us (I got to chapperone). I was in Toronto a few weeks prior to the day so I stopped at a clothing store in "Little India" and asked for a salesperson's help in finding something appropriate for my daughter to wear. I asked several times if her wearing such clothes would be OK but was assured that I was honouring her careworker's special day. I was informed that for a Mehndi the traditional colours were green, brown, and orange all colours referring to the henna paste in its different stages. The henna leaves are green when mashed and made into it's paste, the tattoo is brown when the paste falls off and fades into a vibrant orange with time. I ended up choosing a cream Ghagara with a cream top, a dark green Shalwaar and cream Odhni (hopefully I got all of those names right). She looked so cute in the outfit, I let her wear her ballet slippers with the clothes and we brushed her hair til it shone and she wore it down. Saima was delighted that Lina wore a traditional dress, I was relieved that I didn't make a faux pass. Saima's mother gave all the ladies, girls included, bangles as a gift and Lina delighted in the fact that her entire outfit jingled and shimmered all night. Uma, Saima's older sister had told Lina she would give her a henna tattoo that night. Lina loved watching all of the different customs, and so did I. I took many pictures. Lina did indeed get her tattoo, a pretty flower on the palm of her hand and when we left she was so tired she refused to let me put her arms through her coat because Uma had told her that the longer she left the paste on the darker the tattoo and longer it would last, so she refused to risk smudging it. She went to sleep that night curled up around her hand so that it wouldn't get smudged. In the morning I had to argue with her about letting the dried paste fall off. She had thought it was the tattoo, it took a bit of convincing to let her see that it was the stain underneath that was the tattoo. Her mother-in-law would be so pleased, her tattoo was very dark and lasted at least three weeks, amazing kid. Note: "many people especially brides believe that the darker the mehndi stains her hands the more the groom's mother will love her. " 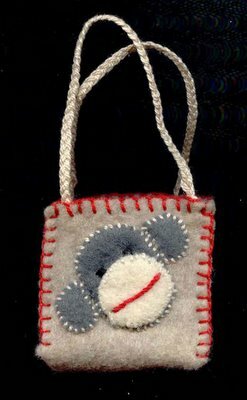 I finished another little bag last night. The taupey grey bag and red blanket stitch made me think of sock monkeys so I tried some felt applique and made a little monkey face. The bag is actually only slightly larger than this scan of it. I have no clue what to do with them. I have a few more to embellish and by the time I am done I am sure Lina will have thought of some use for them. 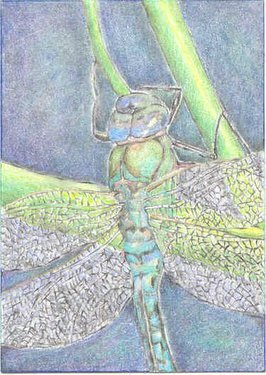 A pretty dragonfly to remind me that Spring really will be here eventually. 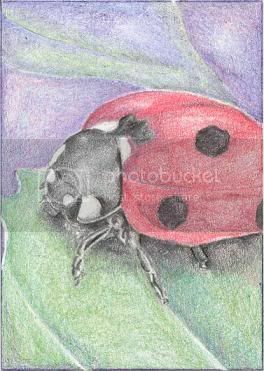 Pencil crayon. Just a little inspiration. 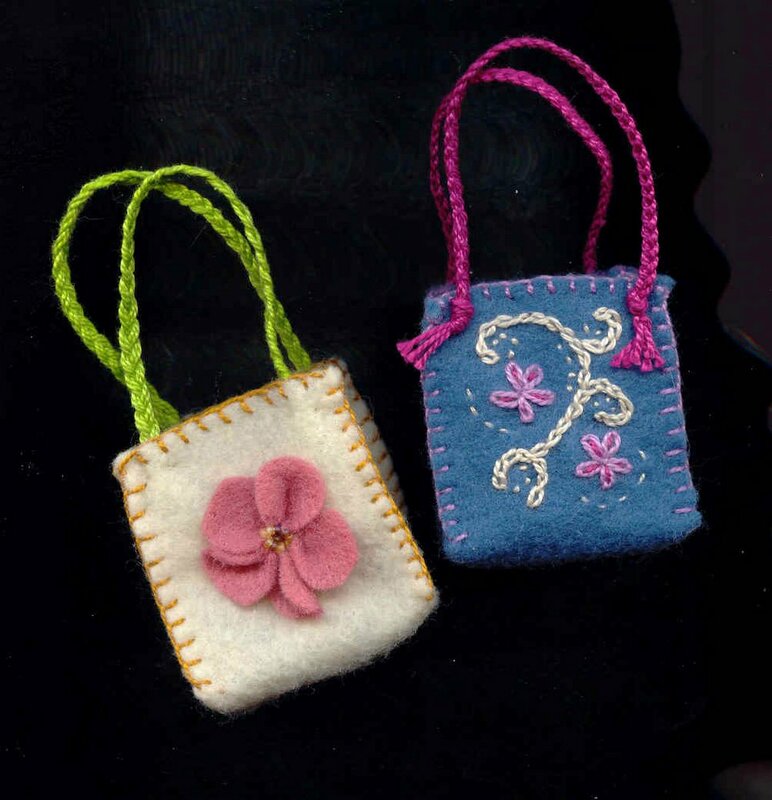 It's the end of the day, I have to go home (and make more miniature felt bags). But I did run across this masterpiece today and thought I would pass it on. You HAVE to go to Craftster and check it out. This is one women's gift to her 1 year old daughter and you really should check out all of the amazing work. Oh look! I can be creative. Yesterday at work, don't ask me why, I started to think about little bags, little felt bags. And I actually went home a made some. This is a milestone in my life. Wow, I think and therefore I create? These little guys are about 3 inches tall. I need to make more!